Cuttack: Chief Justice of India Dipak Misra on Sunday said providing employment opportunities to juveniles can help in curbing crime and other offences committed by them. “It is only through proper employment, juveniles in conflict with the law be made to return t the mainstream,” said Misra. Dipak Misra was addressing the state level conference on ‘Juvenile Justice: Issues and Challenges’ at Judicial Academy in Cuttack on Sunday. He said juvenile justice is based on the principle of safeguarding and protecting children from violence, abuse, discrimination and exploitation. Misra laid emphasis on concrete action plan to ensure that juvenile offenders return to the mainstream through proper employment. “Some source of employment should be provided to the juvenile offenders so that there can be a feedback system to see they do not return to crime. It is only through proper employment, they (juvenile offenders) return to mainstream of the society,” said Misra. The conference focused on effective implementation of the Juvenile Justice Act, 2015 and ensure that a speedy justice for the children in Odisha. Magistrates of Juvenile Boards, police and other officers should not get carried away by their own individual emotions rather they needs to have a rational approach and be guided by parameters, rules and guidelines of the Juvenile Justice Act. 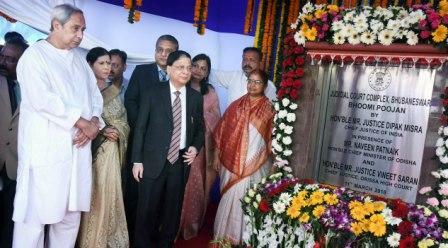 Earlier on Sunday, Chief Justice of India Deepak Misra performed the Bhoomi Poojan ceremony of the Judicial Court Complex in the Civil Court premises in Bhubaneswar here.